Nah, not that we don't disagree... I say mozol tov to the happy couple, cheers! .xmas. Ganbatte mina-san. . . keep chasing the dreams and move forward .santa. Yeah.... erm .... what dream are we talking about again? porcupine_tree wrote: If Reo marries Tomi-chan... my eyes will end up like that! My eyes, they burn like the fires of hell, ARRGHH! both you and kaide are just jealous, haha,i get to marry tomo-chan!!!! Whoever marries any one of the girls is the luckiest guy on earth, and he better treat her right! Then i'd better say i'll marry Haruna or something. jealous because of YUH and tomo-chan?? ?of course no!!! I say we let SCANDAL choose who they wanna marry, my friends! I spoke, and I said no. What does everyone want to be when they get older? I dreammmmm that one day I can hunt giant squids in the ocean! Haha. tomo-chan, haru-chi, rina-chi and mami-chan will definitely choose me. ,lol,haha,just dreaming while awake guys!! LOL free PVs.Just make sure that they're not in the rain,or Haruna'll come after you. EugeneAng wrote: LOL free PVs.Just make sure that they're not in the rain,or Haruna'll come after you. aahhh!! !I almost forget about that...sankyu eugene-boy..
aahh..forget about it..if YUH have my fb account..there's my photo wear seifuku...gurararara!!! Okay okay back to topic. My lifelong dream's....just realised it,i mean i just realised i wanted to do this recently,a few months ago. if either one of you get married to either one of the girls in future, please don't forget to send me an invite, ok? porcupine_tree wrote: if either one of you get married to either one of the girls in future, please don't forget to send me an invite, ok? I know, right? 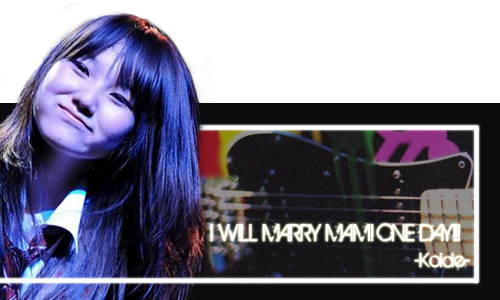 I'll gladly take pictures of MAMI and Koide, but whoever is marrying HARUNA will have a ruined wedding. .santa. I want to marry HARUNAAAAAAAAAAAAAAA, and Koide, I'll totally join the SCANDAL Special PV. We're filming it right outside of HARUNA's house, right?? If you guys are going to have a SCANDAL Special PV, count me in! I'll probably be the guy behind the camera! We've already seen Haruna-chan soaked in her Shoujo S uniform.I'm still recovering from it. I think we should let Haru-chi decide, ok guys? Well, I should warn you though: you might need to wear a seifuku too!